This section contains 5 pages use the Navigation Links at the bottom of the page to navigate. 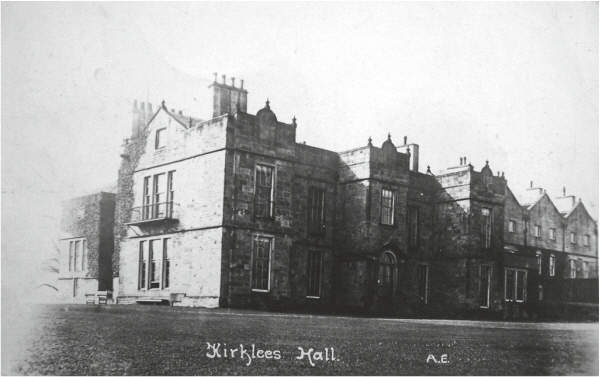 Hal continued to live a carefree existence at Kirklees Hall, that was until the arrival of Robby, a young man employed as a joiner at the hall. Robby took great delight in mocking and tormenting Hal at any given opportunity. One day a visiting guest of Sir George gave to Hal a half-a- crown coin; not an insignificant amount of money in those days. Hal was delighted with the gift but had no comprehension of money and its value, or that this coin would eventually lead to a very bitter ending.A member of the staff commenting on Hal's good fortune commented that it "Took money to grow money" the concept fascinated Hal and he made the mistake of asking the advice of Robby on how to achieve this. Seizing the opportunity Robby convinced Hal to bury his half-a-crown where he said it would then grow overnight into more coins. Hal did this then retired for the night to let his investment "grow". In the morning he was delighted to find the buried silver coin had magically turned into several small value copper coins with which he was initially delighted. Another member of the household upon hearing from the much exited Hal about the magic that had been worked, explained to Hal the wicked deed that Robby had fabricated, understanding now his error Hal vowed his vengeance on the carpenter.Initially Hal's vengeance was fairly benign, he hid Robby's tools and took to telling tales to his sweetheart, one of the housemaids.Hal awaited his opportunity, and one day after dinner Hal observed Robby returned to his workshop where as was his habit he proceeded to take a short snooze while out of sight. Hal quietly snuck into the workshop and carried out his final act of revenge.Throughout that day it was noticed that Hal seemed to be in very high spirits and it was suspected he might have been up to some mischief of one sort or another.At dinner that evening in the servant's quarters it was noted that Robby was late, Hal continued to look very smug at that. When Robby did not arrive by the end of the meal this was commented on, then Hal excitedly blurted out "I've played him a bonny trick this time." "Why, what have you done now?" cried the others, crowding round him; "'what have you hid of his now?" "Oh, I've hid his head under the shavings, and when he wakes he'll be troubled to find it. "With a growing sense of unease those present proceeded at once to Robby's workshop to find out what the still jubilant Hal had really done, there they found a terrible site Hal had cut off Robby's head while he slept and hidden it under a pile of shavings! Hal, who had accompanied them, seemed quite astonished to find Robby dead, he tried to put the head back in place again and on finding the effort was of no use, burst into tears. Hal was handed over to the powers that be at the time and eventually stood trial for the murder of Robby at York. However the judge showed mercy in light of Hal's obvious "imbecility" and rather than a life sentence in prison or worse, chose to release him back into the custody of Sir George Armytage back at Kirklees.However Hal was much changed, gone were his care free days and he withdrew into himself. He was often found sitting by a brook, mingling his tears with the stream. He never spoke a word respecting the death of Robby or would he approach the workshop, or to take in his hand any sharp edged tool. He pined, and with his weak intellect becoming feebler, his health suffered, and he died a premature old man, grey beaded under thirty years of age. However, Hal left a legacy that remained in use until relatively recently whereby locals would refer to foolish behaviour as being "Warr ner t' Al o' Kurklas Ole," ("As bad as the Hal of Kirklees Hall") or a foolish investment as being "Like Hal Piersons Half Crown".